Trough out my life, I have always looked at incidents of public concern as to how they affect black people but sometimes I would forget that white people are people too. It is only when these issues affect my white friends that I begin to come to my true self. A soldier for the underdog! When O.J.Simpson went on trial in the 90’s I wanted him to win or not to be found guilty. Not because he was innocent. But because he was an underdog and he was black and I felt a Blackman universally was on trial not O.J. So, when he won, a sense of victory and jubilation overcame me and I felt good. I even forgot that there were victims in Ron Goldman and Nicole Brown Smith which was a mistake. So let me back up a bit, I first saw Luki at Share World entrance gate where he was waiting for a taxi to town. He had come to see some of the guys that I trained and played football with Joe, Tommy, Chippa, Dance, Nhlanhla, Spear.He was just a tall skinny lanky kid still looking for a break. I then saw him fall over an advertising board after he had tackled a striker………….I then knew that this boy had something special. He always played with his whole heart. It so happened that at that time I used to be training Chippa’s legs with weights. We agreed on one of my favourite training leg routines called three in one. All those who ever trained with me know this regiment………..It is the bomb………I even recommend it for women too if they really want killer legs. Chippa was initially scared of a bit of heavy weights thinking that it would slow him on the field. Now, in a qualifying game against Congo, Chippa crossed the centre line and unleashed a short that send South Africa to the world Cup in France. It was a thunderous short that had more than 60 000 people in the stadium jump from their seats and the then 40 million citizens ecstatic……….I nearly fell from my suite at the First National Bank Stadium………We were going to France and I was part of it, in my own private way. After that day Chippa was never the same…….the less said about that, the better. Anyway, shortly after that both Chippa and Luki were signed by Leeds United in the UK.Chippa was an instant hit and the Elland Road faithful’s sang ‘Waltzing Masinga’ week in, week out. At the same time Luki was not doing so well and never made the team for almost the whole season. He would be sitting on that cold bench. And the UK can be cold. Even though I did not know him as well as Chippa. I felt for him. I prayed for him………I prayed so hard and even wished for a Miracle. For me South African Footballers were on trial. I did not have Luki’s number and we were not close enough for me to just call him out of the blue. But I could feel his pain. And whenever I was in London I would wish that I could take a train just to go and cheer him up. I knew the difference that a voice from home can do to you when you are on foreign soil. I had experienced it with Jonny Mekwa and Jonas Qwanqwa one afternoon at Disneyland. Stan Tshabalala and I would watch Luki and analyse his game and when Goerge Graham and David O’Leary started him as a destroyer we felt it is a role he can grow into but at least he was playing. By the grace of God,Luki persevered and got better and broke records also to become the first South African to captain a Premier League team. And in a crucial game against Chelsea.Luki was given the task to guard Gene Franco Zola. He did an amazing job and marked Zola out of the game until he was substituted. From then he became one of the best man makers in the business. 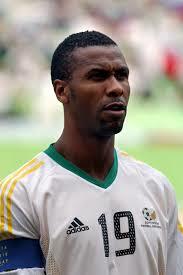 Now, in a game between South Africa and Ghana, Luki marshalled Antony ‘Tony’ Yaboa better than a hawk. Tony as you all know was gifted on both feet with an AK-47 on his left foot and a Bazooka on his right. Tony was so dangerous that he could change the game in two seconds. So to guard him for 90minutes is a huge tast.Luki did it, and brought respectability to defence. So, on Thursday the 2nd of July 2015, I bumped into Luki in Braamfontein at the ORBIT and related the story of our support. It is always my belief that you need to Praise People while they are alive and not only when they are dead. We chuckled and extended pleasantries. When my crew and I left, I knew that I just conversed with one of the best Ambassadors South Africa has ever produced and that our prayers were not in vain.